Before DC Comics wised up and decided to get back to basics with their comic book line calling it "Rebirth," Valiant already had a classic superhero for the 21st century in 'Faith.' Brave, funny, smart, enthusiastic, honorable, and confident, Faith Herbert exhibited all the traits you were used to seeing from a certain alien with a red cape or a shield-wielding soldier from Brooklyn. The rebirth of superhero comics is taking place within the pages of 'Faith' right now. Issue two picks up where the first issue of this new on-going series left off. Faith is in the clutches of Chris Chriswell, A-list action movie star, and supervillain wannabe. Once her celebrity crush, Chriswell now is hoping his nefarious scheme to become the next Doctor Doom or Lex Luthor pays off by using Faith as a martyr. Jody Houser balances the script between comic book satire and heartfelt lessons about self-empowerment and self-image. Chriswell is such an LA-centric villain who's read too many comics and seen too many movies because as an actor his extended monologue is naturally very dramatic and ambitious. Meanwhile, Faith is very calm under pressure and thoughtful throughout. One of the many reasons that make 'Faith' so good is that it has not just one great artist but two. Pere Perez handles the present day events while Marguerite Sauvage handles the flashbacks. Perez sharply illustrates the action in perfectly laid out pages that are clean and exciting. Sauvage provides a wonderful softer collage of images whether it's a flashback here or dream sequences in other issues. Her compositions are without equal. Both artists bring their best in a delightful and almost seamless collaboration. Under less skillful hands, this issue of a superhero in the villain's clutches could have been overwrought and cliched. Instead, true to Faith's character, it's fun, heroic, and self-aware. 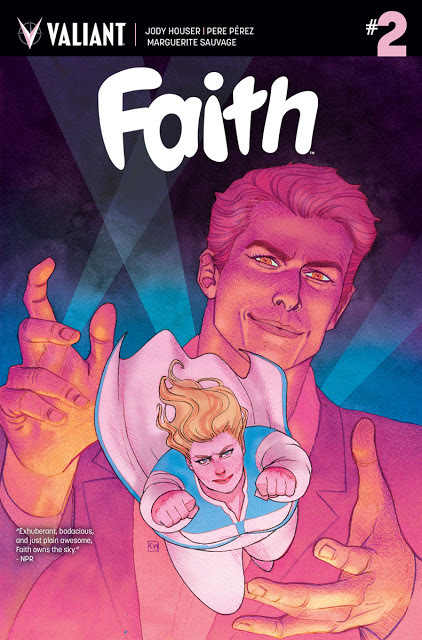 'Faith' made superheroes fun again and it didn't take a whole company relaunch to do it.